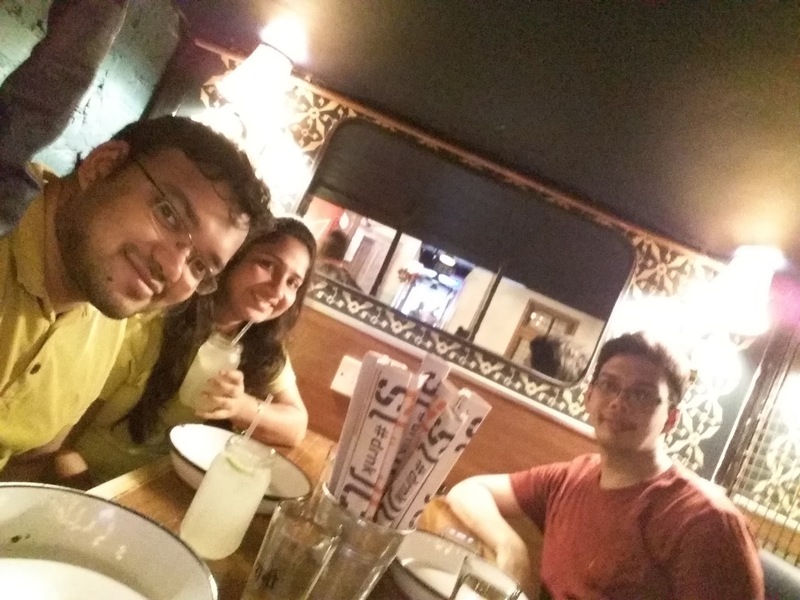 Another of those lunch outings and movie sessions were on cards and this time, younger bro was joining us for the outings. We had a good show of Dhoni's untold story at PVR MGF but the movie was really long and it was almost about 3 by the time we were coming down the stairs of the movie theater. Though the duration of the movie had its share of snacks and nit-bits but those are never enough to satisfy hungry souls like us. 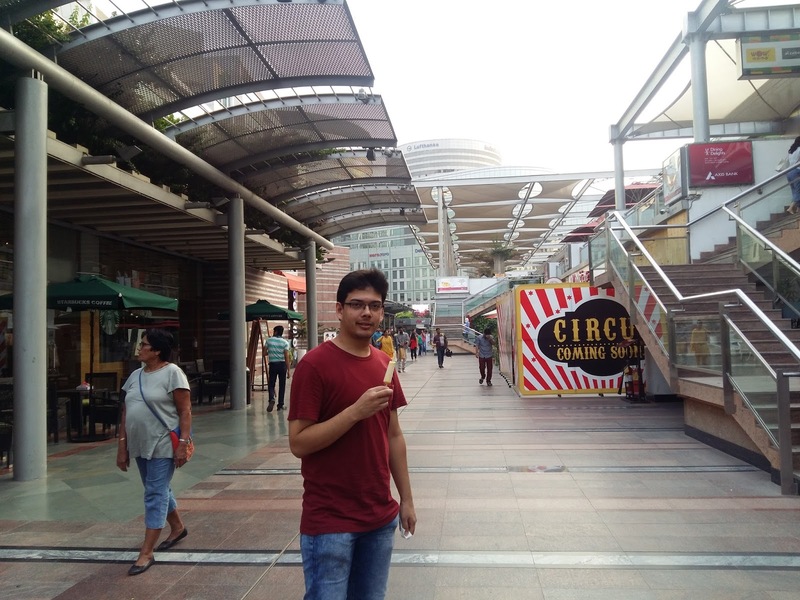 So we decided to head out for a late lunch and the obvious choices led us to finalize our destination as Cyber Hub - the office district of Gurgaon which houses best of restaurants hustled between towers of offices on all its side. We had parked our vehicle and were entering the zone by about 3:30. As we roamed around the concrete zone to put our fingers on the exact restaurant to be tried for that outing, we realized that we were really late for a lunch meal. A number of places had stopped service to prepare for next meal and a few others allowed only a last order after we enter. However, towards the other corner of the area, we saw a new offering which clad a rural look with all the dishes named in typical Hindi with a flavor of village look. There were huge drain pipes on one side which were designed to be outer seating space. We quickly realized that this was the place we would want to go for this lunch. We entered through the "seemingly congested" corridors and confused interiors, we actually needed some guidance to enter into a long tunnel structure. The tunnels led us to a huge hall which had been themed in an interesting way. Through the tunnels, a few rooms were carved out which provide an option of a private meal for 4 to 10 people. The hall that we were in was the main restaurant. 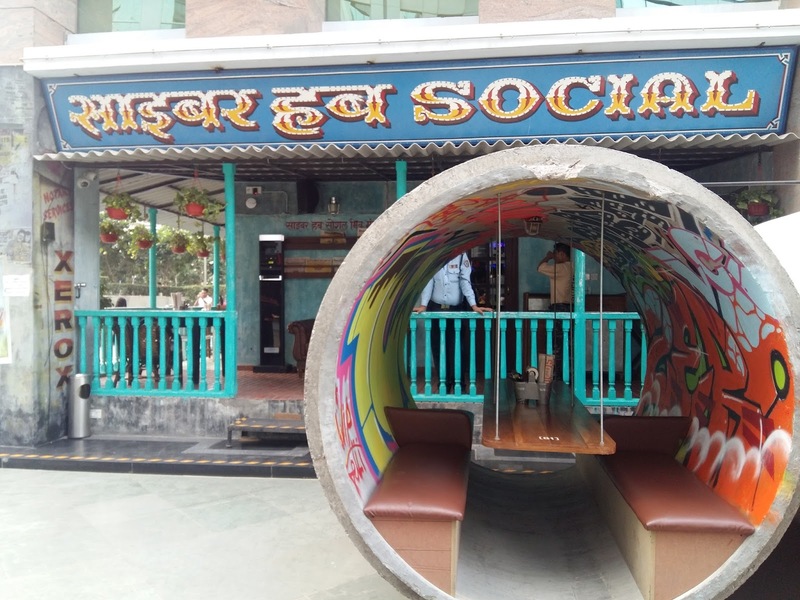 One part of the restaurant adapted the look of a railway coach with seats resembling bearths of Indian Railways. The look was completed with mirrors and electric sockets along with the leatherette cushions on the bench like seating. Another part resembled village "chaupal" or meeting place where elders gather for discussions. The roundtable showcased the structure of such meeting joints with a rustic look and seating. The dance floor donned the look of vast open spaces that villagers use for celebrating festivals. As we settled in and looked at the table, the menu followed the culture that is some coming up in a big way at many themed restaurants. The menu is designed in form of a newspaper - one each for drinks and food. The staff carried a PDA to take order and soon we had settled in on what to eat. It was going to be a typical north Indian fare that day. The mocktails were decent and service was prompt. The quality of food was great too and service size were okayish. They served a naan or paratha with most of the main course items. The waiter warned us adequately about this and hence we saved a lot of food from being wasted. 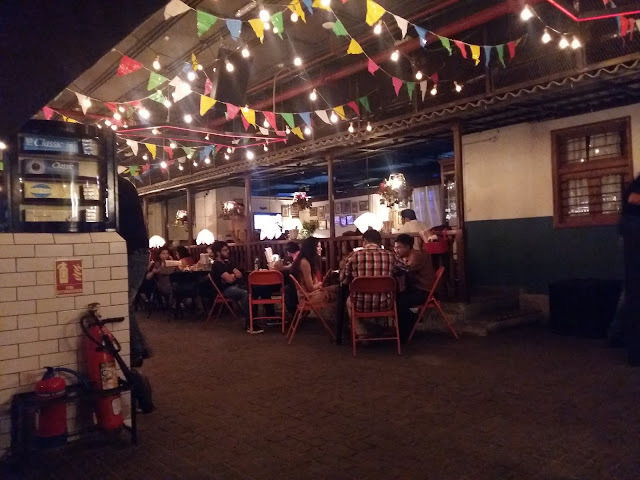 In terms of overall experience, it was a nice ambiance with a unique theme and courteous staff. The food was good and not super expensive. If you wanna hang out with friends or have a private dinner with the special someone, it would be a good place if you choose your table carefully. We ended the outing with awesome Kulfi at a famous outlet in Cyber Hub.